Please support this worthy cause, by donating blankets and warm clothing to the 21st Annual Realtors Care Blanket Drive. 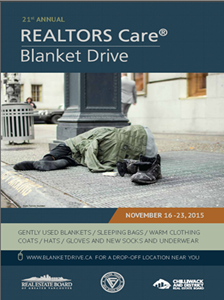 From Nov 16- 23rd, you can drop off your donations at any of the real estate offices http://www.rebgv.org/blanket-drive-drop-locations-0 . If you are unable to deliver to these locations and live on the North Shore, simply give me a quick call and I will be happy to personally arrange to pick them up. North Shore Donations collected will go directly to the Harvest Project and Lookout Society, as well as Covenant House in Vancouver. The Vancouver Police Department are also distributing these items to the homeless on the Downtown Eastside.